Description: Alan Grant sports a lime green shirt with a blue bandana, as well as light grey pants (with a big tear on the right leg, revealing bare skin underneath), a green utility belt and dark grey shoes and gloves. He also has black hair, eye brows and eyes. He stands in a fairly neutral posture, except his right leg is posed in a forward move as if taking a step, and his left arm is raised upwards a little. He comes with a Dino Claw weapon,basically a large hand held contraption which ends in two comparatively small claws than can hook around dinosaur body parts. The claws are operated by a handle on its top side. It is coloured in about the same shade of grey as Grant's pants. The Velociraptor stands in a stalking posture, its right arm and leg stretched out and its head raised upwards with its mouth open, as if it's about to jump on something. The tail is raised upwards and bent at the tip. Most of its head and its underside (throat, belly, lower part of the tail, underside of all limbs) is painted beige, while the top of the head, neck, back and upper part of the tail are painted light brown, this colour running out of the back colouring in small stripes over the upper legs and base of the tail. The rest of the body, most notably the top parts of the limbs and the flanks, is painted yellowish beige. A few dark grey spots are found on each side of the creature on its neck, flanks, upper leg and mostly on the tail. The Raptor has white teeth and a red inside of the mouth, cat like yellow eyes with black pupils, black claws on its feet (but not on the hands) and a black JP logo on both upper legs. 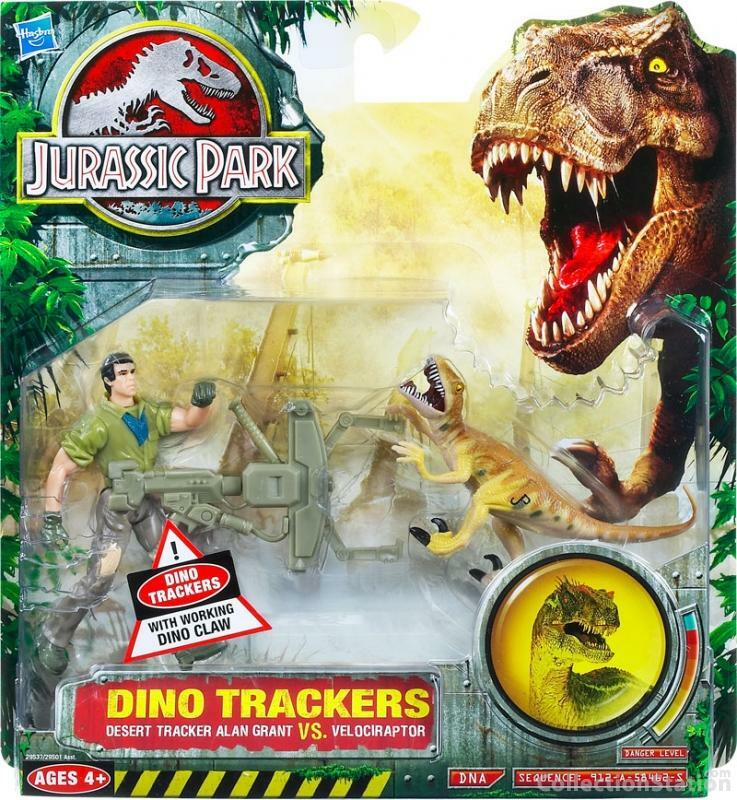 Analysis: Alan Grant finally makes an official return to the realm of JP toys in JP 2009, after last having been seen in the JP III line and making an anonymous appearance in JP Dinosaurs 2). He wears a somewhat less noticeable attire (no excessively white shirt this time), which suits him well. However, the green shirt and especially the blue scarf would give him away easily in a desert environment, so as a 'Desert Tracker' he doesn't seem very successful (hence the tear in his pants, probably). His lame Dino Claw Weapon also would do him little good - in whatever environment - since it has great trouble restraining dinosaurs and is overly bulky and inoperable. Grant had better learn a few things from the Raptor that accompanies him in this set, which combines a desert camouflage paint job with a Velociraptor's usual lethal ferocity. This paint job, though effective in communicating a desert feel for this set as a whole, is pretty standard and offers little surprises. The sculpt itself has been released to death (even in this toy line), and has been done better before. This one isn't necessarily badly coloured, it's just a dull paint scheme and could have used more detailing (like painted claws on the hands too). Overall, though Grant looks more casual and realistically dressed than his predecessors, the continuing use of Hasbro's ugliest piece of JP weaponry and the bland paint job on this overused Raptor sculpt make for a rather standard Hasbro set: just not very exciting. Repaint: yes. This set is identical to the Alan Grant set of the JP III line (Wave 1). Grant has been repainted once for JPD2 (along with his Dino Claw), while the Velociraptor has already been repainted over a dozen times for Camo-Xtreme, JPD2 and JPD3 and would be used several times again for this toy line. The Dino Claw weapon was also used for the Forest Hunter General set of this toy line. Overall rating: 5/10. Not the best sculpts and a lousy weapon, but the paint jobs are pretty modest, certainly compared to some of the wackier repaints in this toy line. They're still not especially appealing or imaginative though. This set is not rare and can still be found with little effort. Since this set was a Toys'R'Us exclusive that could change over time, but probably not for the next decade or so.